STUDENT Sarah Kelly was a recent finalist in the Super Chef All-Island Schools Cookery Competition. Sarah, who attends Scoil Mhuire, Buncrana, made it to the finals after her dish was selected from 900 entries submitted by 200 schools. 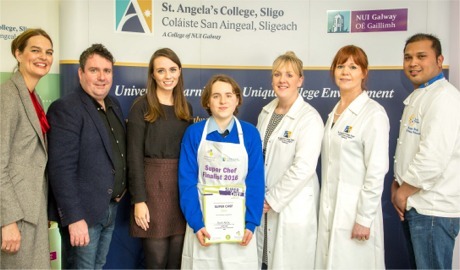 The competition, which is in its second year, was held recently in St Angela’s College, Sligo. It is endorsed by Healthy Ireland and gives students an opportunity to create a tasty, healthy and affordable meal for two. Sarah Kelly, centre, who was a recent finalist in the Super Chef All-Island Schools Cookery Competition.